WKU will host the 104th annual meeting of the Kentucky Academy of Science Nov. 2-3. Workshops, research presentations and poster sessions will be held at the Downing Student Union, third floor. Between 600 and 700 participants from Kentucky and the region are expected to attend. More than 130 WKU students and faculty will present research during the two-day meeting. A highlight of the 2018 meeting will be the “Behind the Scenes at the Corvette Cave-In” presentation Nov. 2 during the Reception and Plenary Session at the National Corvette Museum. Dr. Jason Polk, associate professor of Geography and Geology at WKU; Katie Ellison, marketing and communications at the NCM; Ric Federico, business lead and branch manager for EnSafe; and Craig Smith, senior project manager from Hayward Baker, will discuss the sinkhole that swallowed eight Corvettes in February 2014 and how and interdisciplinary team of scientists and technicians came together to study and repair the sinkhole, as well as develop the Corvette Cave-In Sinkhole Exhibit at the museum. The Reception and Plenary Session will be held from 7 p.m. to 10 p.m. and will include the presentation of the 2018 Science Education and Outreach Award. "It’s very exciting to host the KAS annual meeting at WKU and the plenary session at the National Corvette Museum,” said Dr. Leslie North, KAS president-elect and associate professor of Geography and Geology at WKU. “The University is a showcase for many innovative STEM activities and initiatives in Kentucky and even regionally. “We are fortunate to be able to showcase some of those activities during the event and encourage many WKU students and faculty to share their exciting research with colleagues from across the state. Likewise, by participating in the KAS meeting, we get to learn about exciting projects going on at other universities and institutions and make meaningful connections with colleagues,” said Dr. North, who will begin her term as KAS president following the annual meeting. The KAS activities will begin with a Science Movie Night at 6:30 p.m. Nov. 1 in Downing Student Union, room 3020. The movie night is open to the public. The KAS Science and Policy Advocacy Workshop will begin at noon Nov. 2. Speakers for the workshop, which is sold out, are Matthew Gentry from the American Society of Biochemistry and Molecular Biology, Alexa Johnson from University of Kentucky and Trent Garrison on behalf of the Kentucky Academy of Science’s Education & Advocacy committee. 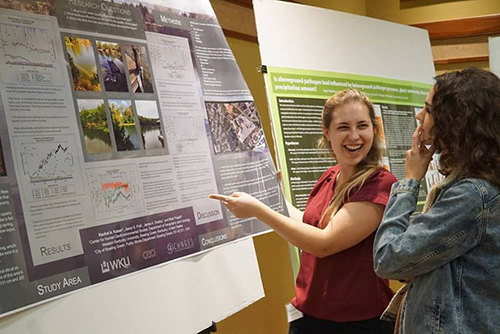 A poster session and social hour will be held from 3 p.m. to 6 p.m. Nov. 2 in the Downing Student Union. The Nov. 3 schedule includes poster displays, exhibitor tables and oral presentations. The KAS is hosting a social media photo competition and is encouraging participants to post photos using the hashtag #TheSpiritOfKAS on Facebook, Instagram and Twitter. A prize will be awarded for the winning photo. Members of the WKU event planning committee include Leslie North, Ryanne Gregory, Claire Rinehart, Rodney King, Kerrie McDaniel, Richard Gelderman and Cheryl Davis.